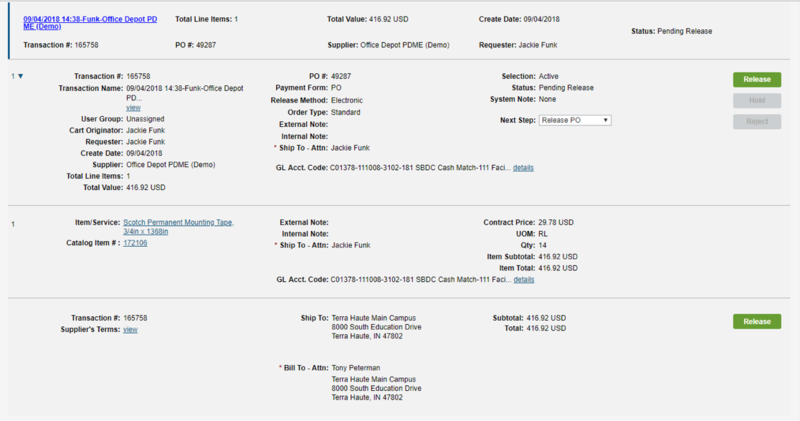 When a user accesses the Approve or Manage tab, the transaction data will display in a collapsed view. Clicking anywhere within a transaction will expand both the header and line item detail to allow for transaction approval or other edits. If Tax Code functionality is enabled, the Tax Code fields will display on the Invoice tab for header, line and no match invoices. 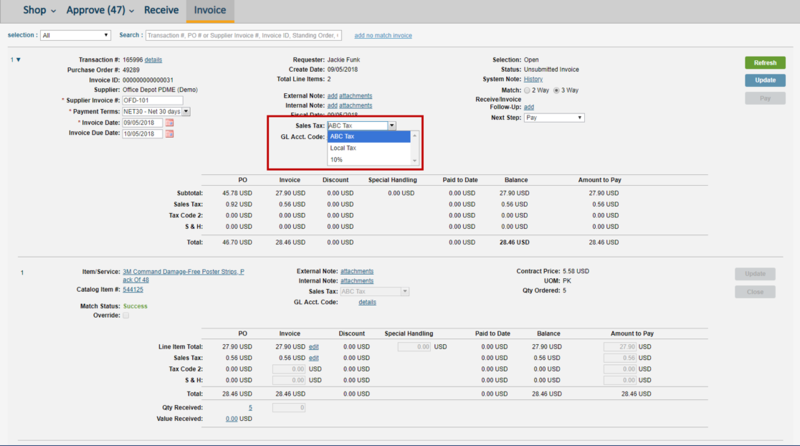 When creating a manual invoice, the Tax Code 1 and 2 (if configured) fields can be used to populate the invoice tax values. Invoices received electronically from a supplier will continue to apply taxes across each line item when specified. The existing email notification for electronic invoices, which generates whenever an electronic invoice posts to Purchase from the invoice hub, has been corrected to remove language related to “may require your review.” A separate email notification has been added specific to match failures. The new notification generates whenever an electronic invoice posts to Purchase and a match failure occurs due to missing receipts or tolerance exceptions. In the Invoice Configuration > Email Notification screen in Entity Admin, individual users and user groups can be configured to receive one or both types of notifications – General or Failure. A Clear All button has been added to the Order Summary screen. The button will activate once a user enters search criteria. Selecting Clear All will remove all specified search criteria; any search results at the bottom of the page will remain. An Event Number will display for each event created in the Sourcing application. This read only value can be used to identify an event with suppliers, search events or create reports. Two new fields have been added to the Event Header: Q&A Cutoff Date and Q&A Cutoff Time. These fields are optional and will default to blank. When a Q&A Cutoff Date and Time are specified, suppliers will not be permitted to enter questions once the cutoff has occurred. This date will also be visible to suppliers in the Event Header.